Arrived in Chicago the coach was waiting also the local tour guide who started as soon as we're grouped together ...in the station which is Union Station! Lots of films been made there also a lot of history. We had a tour of the city for a couple of hours , stopped of at Mcie D. As we hadn't had a good sleep most of us just wanted together to our Hotel. The MileNorth Hotel , however when we got there we felt ok and me & Doris went for a walk around our area, it was buzzing ...we stopped at this Italian restaurant were we enjoyed a nice meal + a bottle of wine. We fell into bed and slept well. We didn't rush about , took thing at leisure as our day was our own. We left to catch train to Buffalo to see Niagara falls ,once we all got on train and had cheese and biscuits and wine,in dining car it was a lovely atmosphere then into our little roomette with a sink and toilet l had to get on top bunk of course, l didn't sleep to good.we went to see Niagara falls it was great experience back to hotel showered in bed 4 pm we are knicker knackered. 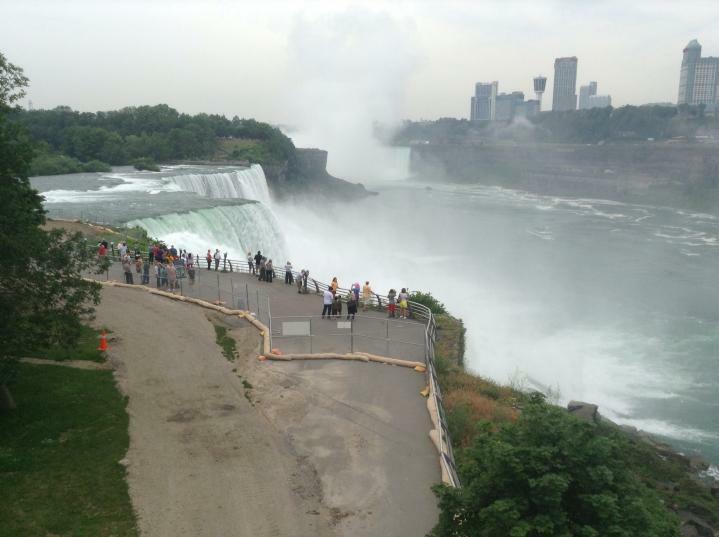 As Doris mentioned Niagara Falls it was fantastic it is one of the 7wonders of the World, we didn't think we would see a lot of of it being in the USA as the best side is in Canada but we saw both ! We took a boat all loaded with everyone dress in blue mac's from head to toe and we were still soaked from top to bottom! My legs are sooooo much better its must be all the walking we are doing. The hotel we are in is only 10 mins walk to the Falls! The Sheridan it's the worst hotel of the trip ( not nice ...yucky ) good job it's only been one night. We are both sitting up in bed playing on our iPads time is 6.40am I must have slept 12 hours in all, Doris was pottering about for a while!